A musical journey through the steppes, culture and history. “The polyglot vocalist reawakens the Tatar warriors. Karolina Cicha is one of Poland’s most accomplished and interesting vocalist, not least for the choice of muic she performs. Her NINE LANGUAGES album (2013), with the brilliant multi-instrumentalist Bart Pałyga, was performed in the nine languages found in her native Podlasie region of north-east Poland. 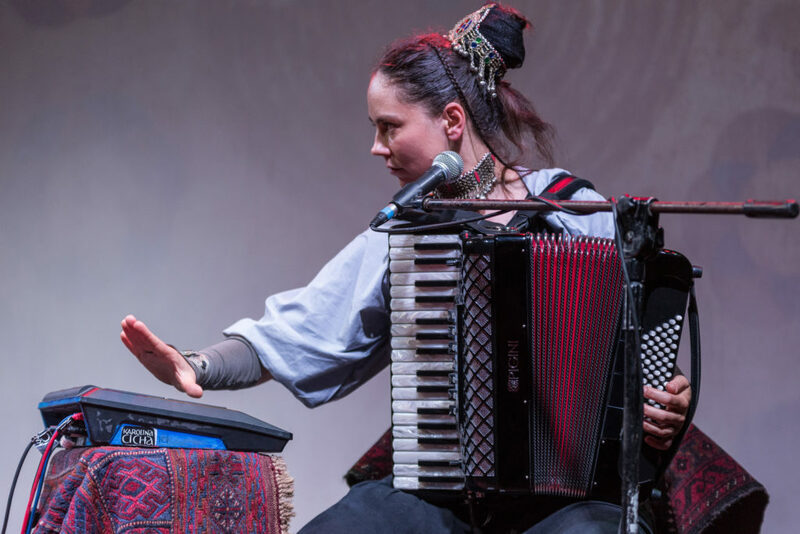 Two of thise were Tatar songs, and here she has recorded a whole album of them, with Bart Pałyga throat singing and playing steppe-derived instruments and percussion. The tatars first came as invaders in the 14th century, but some were encouraged to settle as they were superb warriors, and there’s Muslim Tatar population there to this day and two historic wooden mosques close to the Lithuanian bordeor east of Białystok. Nothing remains in Poland of the language and music, however, so Cicha has had to source songs from the Volga and Crimean Tatars, while the album ends with a new song in Polish telling their story. In CD eddition you can find allthe teksts with translation and transribtion into latin alphabet (easy to sing with). There is also an essay about Polish Tatars history and tatar music. Recorded by Andrzej Kijanowski in a wooden house in the village of Czarna Buchta in the Podlasie region in November 2016. Analog equipment provided by Andrzej Giegiel and Karol Dobrowolski „Agrorecording”. Extra recordings of guest musicians by „Dobra 12” Studio in Białystok.